After eleven wonderful years, the Playabile aka MeTV was retired, but we love its original page so much we had to create a new page for our 2nd mutant vehicle furniture carrier. They think Playatech is a company!! LOL. As usual for Playatech, Sunshine just did the engineering and wrenching. For everything about our new castle that’s pretty from the paint to the fabrics, thank Glimmer, Playatech’s VP of Branding since BM 05. Yes, she really used to run around burning our logo into your furniture with a fire brand, as a thank you for that $5 donation to the arts that you thought was a payment to our company. Company? What company!!! 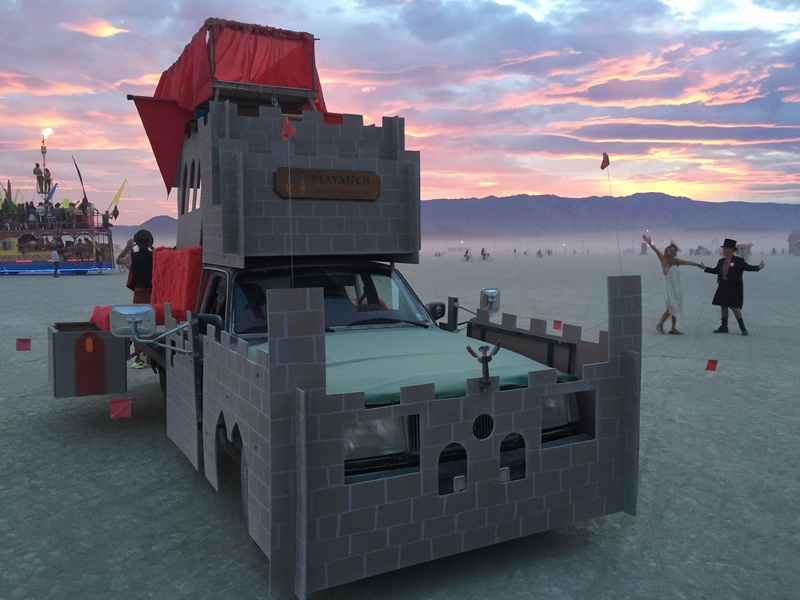 The only thing we do like a company is sponsor a racing team, and the Flaming Castle is our newest entry in the world’s most ridiculous 5mph demo derby. Don’t tread on the Flaming Castle! !